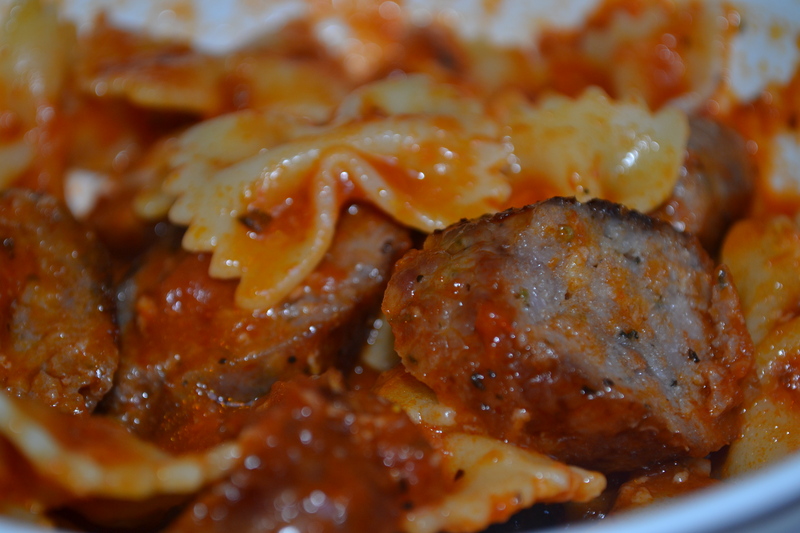 Sweet Italian Sausage with Farfalle and Parmigiano-Reggiano – Butter, Baking, and Bacon! My favorite “genre” of food is Italian and I am always looking to create various pasta dishes for quick lunches and dinners. To me, there is nothing better than al dente pasta topped with a rich tomato sauce and grated Parmigiano-Reggiano cheese and sweet basil. But when you add some roasted Italian Sausage into the equation, an ordinary pasta dish is transformed into simple joy! I make this dish two different ways–one for when I have a nice lazy afternoon ahead of me for the long version and one that’s a shorter version, for a quick and tasty meal! Here’s the quick version! This is so simple, don’t blink or you’ll miss the recipe! Rub the sausage links with olive and sprinkle liberally with salt and pepper. Roast in a 400 degree oven for 18-20 minutes. Remove from oven and allow to rest. In saucepot, simmer tomato sauce with sugar for 5-10 minutes. Add heavy cream and reduce heat to low. Cook pasta according to package directions. Drain and mix with sauce and grated cheese. Slice Italian Sausage into small pieces and mix with pasta. Serve with crusty Italian bread! Previous Post Take-Out? Yep, from the Kitchen to the Table!